Pope Francis recently has sent different signals about his own thinking about possible sainthood for Pius XII. ROME — Vatican officials will look you straight in the eye and say that decisions about naming saints are never driven by politics, but the truth is that those assurances, plus a Euro, will get you a cappuccino at a bar across from St. Peter’s Square. Anyone with eyes can see that politics often enters the picture, especially with regard to how fast or slow a case moves. Nowhere is that clearer than with Pope Pius XII, the pontiff during World War II whose record on the Holocaust remains a flash point in relations between Jews and Catholics. Conventional wisdom holds that the Vatican is convinced Pius XII deserves a halo, but is going slow out of deference to Jewish sensitivities. One oft-made argument is that no judgment should be reached until the Vatican’s archives from the war years are completely open, so researchers can explore what Pius knew and when he knew it. Read more from John L. Allen Jr.
Pope Francis recently has sent different signals about his own thinking. Last week, the pope gave an interview to the Spanish newspaper La Vanguardia and issued a stirring defense of his controversial predecessor, among other things claiming that 42 babies were born during the war years to refugees hiding in Pius’ own bedroom. Here’s why acting now might actually be Francis’ better option. First, it’s likely a fantasy to believe that opening the archives will magically resolve questions about the pope’s record. The debate over Pius XII is largely counterfactual — it’s not about what he did, but what he should have done, and no historical “smoking gun” can settle that one way or the other. Second, Pius XII is destined to remain a cancer in Catholic-Jewish relations as long as his case is still open. One way to break the cycle would be for the Vatican to announce definitively that Pius XII will never, ever be canonized. Under church law, however, that’s a nonstarter, because no pope can bind the hands of his successor. Even if Francis were to issue such an edict, it would expire with his papacy. The only other way to take Pius XII off the table is to declare him a saint. Experts might still slug it out in seminars, but the world at large would lose interest once the drama of “will they or won’t they?” is over. There’s a parallel with St. Maximilian Kolbe, a Polish Franciscan priest, and St. Teresa Benedicta of the Cross, better known as Edith Stein, both of whom died in Auschwitz. When their sainthood causes were underway, many Jews and not a few Catholics protested — in Kolbe’s case because he allegedly sponsored anti-Semitic publications, with Stein because she was a Jewish convert to Catholicism and sainthood could be seen as an invitation to proselytism. Whatever people thought about those arguments, they largely stopped having them in 1982, when Kolbe was canonized, and 1998, when Stein was named a saint. At that stage, there was nothing left to either block or support. Pope Francis is famously fond of Jews and Judaism. His Vanguardia interview was with a Jewish journalist, Henrique Cymerman, who helped put together last Sunday’s prayer summit with the Palestinian and Israeli presidents. No doubt the pontiff is reluctant to do anything that might cause hurt, but postponing the decision may cause more anguish in the long run by keeping tensions at a boil. Ultimately, politics won’t be the only factor in Francis’ choice. If he wants the best political read on the situation, however, it’s likely this: If you know you’re going to do this eventually, then do it now, because sometimes the only way around a problem is straight through it. Change tends to breed resistance, and one form it often takes is character assassination of the people involved. If they’re smart, the architects of these rear-guard actions start with the low-hanging fruit, meaning people who for one reason or another make themselves easy targets. In a nutshell, that may be the story of Francesca Immacolata Chaouqui, arguably the second-most talked about Vatican personality of the last year after Pope Francis himself. Before long, however, she also became the object of gossipy and often nasty public commentary, which she believes is driven by enemies of Francis’ reform. For the record, Chaouqui claims she never sent the tweets and that they’re fakes. Chaouqui acknowledges that the pictures are from her Facebook page, but says they were an eight-year-old anniversary present from her husband intended basically as a joke. Most recently, Chaouqui was at the center of yet another media storm when she was photographed at a reception on a Vatican rooftop during the April 27 canonization ceremony for Popes John XXIII and John Paul II, a VIP-laden event that allegedly cost more than $20,000 and supposedly left the pope fuming. Some leapt to the conclusion that Chaouqui put the event together. She denies it, joking that “I can’t even organize my house,” and insisting that although she was in attendance, nothing scandalous happened. “What exactly is sinful about having a sandwich on a terrace?” she asked. The daughter of an Egyptian father and an Italian mother, Chaouqui is a feisty personality who sometimes seems to court controversy. Before her Vatican adventure, she outraged her native Italian region of Calabria by suggesting in a newspaper that Calabrian men are conditioned to see violence as normal after a young man there burned his 16-year-old girlfriend to death. Some Vatican insiders were never sold on her appointment. If the idea was to bring in world-class experts, they asked, why turn to somebody who’s relatively inexperienced, and whose background is business communications rather than anything to do with the church? Some also see her as more talented at cultivating friendships than producing results. Yet whatever the legitimate question marks, it’s hard to ignore that most of the attacks on Chaouqui have nothing to do with her performance. That commission recently shut down, with most of its line-up moving over to a permanent new Council for the Economy created to oversee the Vatican’s finances. Chaouqui was conspicuous by her absence on the new body, though she insists it’s not because her enemies made her radioactive but because her expertise was no longer needed. Perhaps the bottom line on the saga is this: Pope Francis and his team probably ought to be careful about who they bring on board, especially if they’re Italians. If there’s a way to make them look bad – whether it’s self-inflicted or manufactured – somebody will find it. The following are excerpts from Chaouqui’s June 12 Globe interview, which was conducted in Italian. The English translation was reviewed by Chaouqui. Globe: What’s the truth about the tweets? First of all, some people say that I’ve claimed my Twitter profile was hacked, but there’s no question of that. What happened is that somebody cut and pasted a few of my real tweets, using either MS Word or Photoshop, and then changed some of the words. They took this collection of doctored tweets, turned it into a PDF file, and sent it to the newspapers. Most of these tweets were totally invented. The one about Bertone is completely false, as is the one about Tremonti. (Bertone is the senior Vatican cardinal mentioned in one of the disputed tweets, while Tremonti is the former finance minister.) I never wrote anything like that, and I never even thought it. If you just consider it logically, at the time I was responsible for external relations for a major commercial company and Tremonti was the minister of the economy. I would have had to have been crazy, because they would have kicked me out of the office! The whole thing just doesn’t stand to reason. Other [tweets] were based on things I had written, but they were altered to make them say something else, for example to make it appear I said that Benedict XVI had leukemia. Do you know exactly who did it? What’s the story of the pictures? My husband took the pictures. They were a gift for me, which my husband touched up with Photoshop making me look more glamorous than I actually am. The pictures were then put into an album on Facebook, under the heading “If only it were like this!” By the way, the pictures are eight years old. They were taken at the time of our second anniversary. That means they were put on Facebook when I was 24 years old, and I had the life of a 24-year-old. Some say that you organized the April 27 reception on a Vatican terrace. Did you see anything scandalous? Not at all. Basically, all we did was take part in the Mass. Afterwards there was a small bite to eat. I’m sure most of the money was spent went putting up the platform. I don’t think there’s any offense against public morality in taking part in a Mass and then having a snack. What exactly is sinful about having a sandwich on a terrace? Do you believe these attacks come from enemies of reform under Pope Francis? Absolutely, that’s for sure. Unfortunately for the peace of mind of those enemies, we’re still here and the reform is still happening. Couldn’t one say that in your case, the attack worked? You weren’t named to the new Council for the Economy. I don’t think that has anything to do with it, because my area of competence was focused on the financial reorganization of the Vatican’s means of communication. The profile needed for the council is different. It’s a papal body made up of experts in finance and economics. I can read a balance sheet, but I don’t have the technical ability to certify that one is correct. Do you think the criticism against you is because you’re a woman? I don’t think gender had anything to do with it. I think it might have been different if I were French or German, because I believe it was my nationality that made me a target. The Italian press pays a lot of attention to the Vatican, and often it’s more interested in speculating about what’s happening behind the scenes than in the real story. That’s considered more appetizing, tastier, for the Italian public. Given all the problems facing the media industry today, at least I helped sell a few more newspapers. Some say the financial reform now underway in the Vatican is an historical turning point, others that it’s a case of everything changing so everything can stay the same. What’s your view? I think it’s an historical turning point. In part that’s because of Cardinal [George] Pell, whom I support completely. (Pell is the Australian cardinal tapped by Pope Francis in February to oversee this new finance ministry.) In part it’s because of the weight now being given, really for the first time, to the role of laity on the council. I also think the rules will change to make the process more collegial. 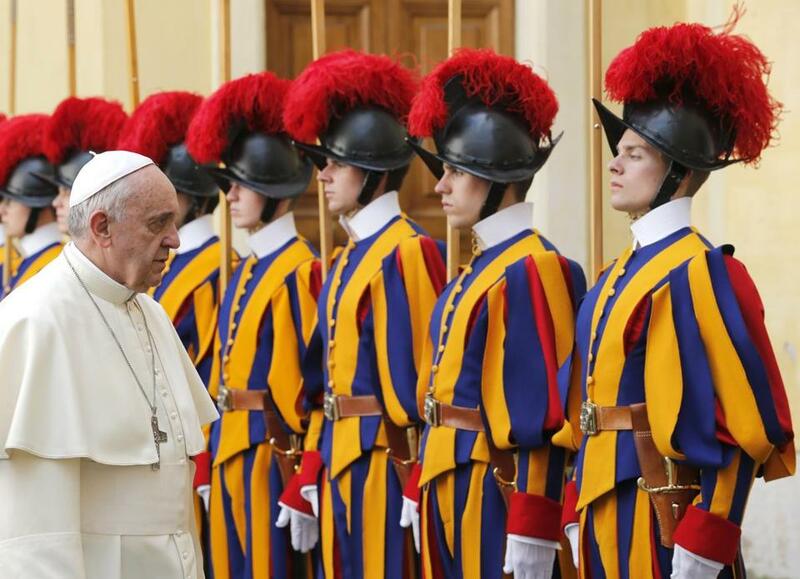 Do you hope to have a future role in the Vatican? I’m at the disposition of the pope, of Cardinal Pell, of the Secretariat of State, and the Vatican in general. They all know that if I’m able to help, all they have to do is ask. That said, I’m not looking for a Vatican job. My hope for the future lies elsewhere. Actually, my goal is to pursue my career outside Italy. I’d like to work in America. Read more by John L. Allen Jr.